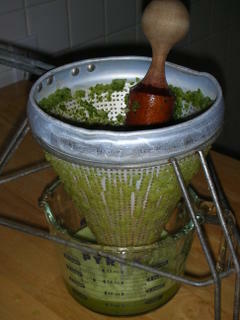 I inherited this chinois (sheen-WAH) from my mother but didn't know what it was called or even, truly, what to do with it. And I'm so glad I did! It makes the smoothest of sauces and soups with very little effort. I wouldn't give up the food processor. But I'm happy this came home with me. I see that they're still for sale, as here on Amazon though I suspect they'd be available less expensively at yard sales and even on E-Bay. Since mine has characteristics of each, I'm not sure what to call it! But I'll tell you this: it's one of the most useful utensils / appliances in my kitchen and I'm surprised how often I turn to it for soups and drinks, especially. If you've got access to one, grab it! What would you call it? I looked at food mills, that wasn't it. The cone shape got me, I guess, and the wooden pestle. my husbands (he's72) grandmother gave me hers many,many years ago.she called it a ricer. Hi Anonymous ~ Thanks so much for writing! And how interesting, the ricer idea. I'm familiar with my own mother's ricer (the same generation as your husband), it made gorgeous fluffy mashed potatoes, among other things. I suspect that the holes in what's pictured here are much smaller than that. I have the identical one shown in the picture that I got from my grandmother. She called it a ricer as well. Actually, according to SAUCES by James Peterson (THE authority on sauces), china cap is another name for the chinois. Both being discussed here are chinois. One is a course chinois, the other a fine chinois. My parents call it a Foley Mill.